The mission of the office of Dr Anita Gallo & Associates is to fulfill the vision and eye care needs of their patients through research, education and clinical care, all of which enhance their quality of life. The doctors at our office are independent primary health care providers who specialize in the examination, diagnosis, treatment, management and prevention of diseases and disorders of the visual system, the eye and associated structures as well as the diagnosis of related conditions. We’re proud of our great range of frames, lenses, and contact lenses. Patients always tell us that we have the best selection of eye-wear in Vaughan. From prescription glasses to contacts, and everything in between, our patients benefit from the wide selection. With our honest expert advice, you’ll be sure to find what you’re looking for. How clear is your vision? 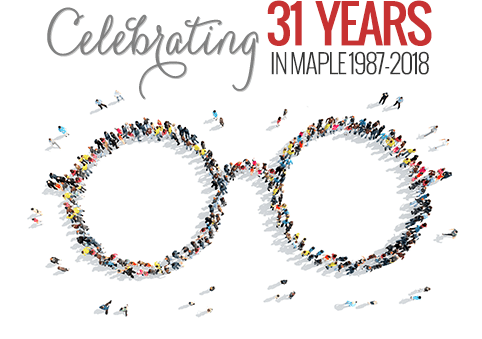 Dr. Gallo and Associates have been leading providers of optometry services and vision care products in Maple since 1987. Our experienced eye doctors offer comprehensive vision examinations at all of our locations and specialize in the diagnosis and treatment of a wide array of eye diseases, conditions, and problems. We use advanced diagnostic technology and vision correction products and are committed to improving the quality of life through enhanced vision. Give yourself the gift of clear vision – schedule an appointment with one of our eye care providers today.